In this live drum lesson, Tim Waterson joins us to teach single and double bass drum applications. Tim takes you through some basic single and double bass beats that will spice up your drumming and give you a dynamic edge. Before learning how to play double bass, you first should get as good as you can at single bass drumming. A way of taking your single bass playing to a whole new level is by trying to play slow to medium double bass patterns with only one foot. Tim started developing this concept by working on the double bass triplet patterns you see before you. While practicing these beats, Tim noticed that he performed full long full strokes with his foot, which was still a lot of work. So, as speed increases you will have to increase the level of control of the beater, and as such, your technique will have to change with it. These grooves are a great way of not only practicing your single foot single strokes, but of practicing the swivel, which was teached on the previous lesson. As you develop your single foot speed and control, you can start thinking about dropping some extra notes with your left foot, to achieve some cool double bass drum patterns and rolls, just like the ones you see below. The first two beats are the first two measures of the last patterns shown and are played with your right foot. The remaining beats are some ideas you can use to start adding some notes with your left foot. The behind this isn’t to tell you to not use the double bass, since there is nothing wrong in using it as you see fit. This section is more about showing different approaches to common double bass drum playing, but with only one bass drum pedal. This way, we hope to make you start thinking a little outside of the box. One of the most common patterns to play between hands and foot for single bass drum players is the triplet hand-to-foot combination: R L F. Although being showed with the hands playing on the snare, feel free to experiment and move your hands around the kit, just like Tim did in the live lesson. Some double bass players do the exact same thing but add an extra bass note with the second pedal, to play a 16th note hand-to-feet combination: R L F F.
Try moving your hands around the kit with this one also. You can perform this pattern with a double pedal but you don’t really have to. Great legends like Buddy Rich, John Bonham, Ian Paice and Carl Palmer, just to name a few, could play this exact same pattern by using only one pedal. This enabled them to keep time with the hi-hat while doing so. The great problem of playing this pattern with a double pedal is leaving the hi-hat unused, which sometimes may hinder the band’s time sense. The next pattern takes the two hand-to-feet combinations we have seen so far, and adds the hi-hat pedal to them, while the right foot takes care of all the bass drum strokes. This sequence starts with the triplet hand-to-foot combination and is followed by the 16th note hand-to-foot combination. As speed increases you can use the heel-toe for double stroking with only one foot. This technique is teached on two live lessons: #3 and #19. You can also use this idea of playing a double stroke with one foot while keeping time on the hi-hat, as a way to spice up your double pedal fills, interchanging between that and the double bass hand-to-feet combination. Although being a great double bass player, Tim tries to do everything with only one pedal, especially when playing at slow tempos for double bass drumming. This enables him to keep time with the hi-hat pedal, which makes playing with him a whole lot easier for any band. The next grooves will help you to feel the difference it makes to add the hi-hat pedal to your playing, in comparison with only using the double bass pedal with your feet, whether in keeping time or in grooving it up with the foot-splash. Adding the hi-hat pedal makes everything sound more musical. These grooves are also great for practicing the swivel, once you get to higher tempos. You start by playing quarter notes on the snare, 8th notes on the ride, and 16th notes with the bass drum pedal. On the second measure, instead of playing all four quarter notes on the snare, you play the first three and then add two extra hits, one on the A of 3 and one on the AND of 4. Next, you keep playing the same patterns with the right hand on the ride and the bass drum pedal; the snare drum is on the A of 1, the AND of 2, the A of 3 and the AND of 4. In this measure you start using the hi-hat foot, by pressing the pedal down on 2, 3 and 4 and by playing the foot splash on the ANDs of 2, 3 and 4. The last measure of this pattern is an extension of the third. 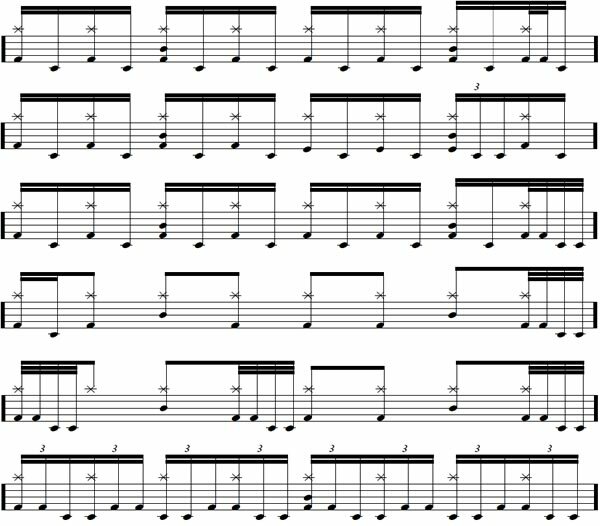 After you can play these grooves as they are, try playing them with a double pedal, as this will enable you to have a clearer notion of how much of a difference the hi-hat makes to the beats. Single bass drummers can use the hi-hat pedal as a way of keeping the pulse of song going strong. A lot of the old school double bass players, like Carmine Appice, would keep time with their left foot on a bass drum pedal, instead of using the hi-hat. Since they were used to doing that on the hi-hat pedal, they just naturally switched to the left bass drum pedal to do exactly the same. They would then add extra hits with the right foot to create some double bass grooves. Since the hi-hat is free, and you are still keeping time with the left foot, but on a bass drum pedal, you could put your foot in between the two pedals and play them at the same time. This way, you keep a pulse for the band to follow and at the same time play double bass patterns. These last three grooves show the transitions between keeping time using only the hi-hat foot pedal, keeping time with the left bass drum pedal and playing the two pedals at the same time. Try transitioning from one groove to the other; this will give you a better feel for how these types of ideas can work. You can also use this concept in conjunction with the heel-toe technique to come up with some cool grooves like this next one. Another great and different way of approaching double bass drumming comes in the form of multi-pedal orchestration. Now, instead of playing the left bass drum and hi-hat pedal at the same time, we will use different combinations between them to achieve some interesting ideas. In the first two measures you keep time by playing 8th notes between the left bass drum and hi-hat pedals. On the next two measures we shake things up by keeping time, by playing one note on bass drum followed by two on the hi-hat pedal. In the last pattern you play a single paradiddle between the left foot pedals. For those who want to play double bass rolls, Tim introduced some ideas, that enable you to spice up a roll using the heel-toe technique. Here you have some of the patterns he played during the live lessons. The higher you crank the spring tension on your pedals the harder your legs will have to work for each stroke, and as such, the quicker they will achieve a greater level of conditioning that will enable greater speed. Remember to always play relaxed even when having the springs at a higher level of tension. Playing rudiments with the feet will definitely increase the level of control you have over your bass drum pedals. For instance, Tim uses a lot of rudiments in his bass drum playing. You can listen to him playing the seven stroke roll on some of the solos. So if you want to practice rudiments with the feet, by all means go for it. For acquiring speed with heel-down playing you have to learn how to control the beater. As for playing fast doubles while in this position, you can use your toes to do so. Tim uses the HansenFutz pedals to practice when he’s at home. They have a compression spring that you push down when pressing down on the pedal. The spring will in turn push your foot back up, enabling you to really work out your leg, whether performing the up or the down strokes. When you practice you foot technique on the floor, the up stroke is the only movement that is making your leg work, since the down stroke is a result of gravity. So with this pedal, you have a really complete training for your legs.